CGAP commissioned Busara to carry out a behavioral diagnostic to understand behavioral barriers to digital savings. After that, Busara was requested to design a set of experiments for lab testing to identify the highest potential solutions in digital communications and promotions at scale with an MNO partner. Social Influence -- Our preferences are rarely ours alone. We tend to take cues, leads, and trends from our peers, and the process of defining an identity bring with it pre-packed products and solutions for that group. Agency -- Our perceptions of control and agency over events often influence our willingness to adopt new tools. Consumers with low agency levels tended to be associated with less formal mediums for saving. Mental Accounting -- We often think in distinct accounts of expenses, even when resources are easily fungible. Recreation spending holds a unique value different from savings value. The mental models for storing value (savings vs. safe-keeping) led to even more complex accounting. Upon identification of the main themes, we carried out tests (live on the platform and utilizing Busara’s lab facilities in TZ) to map out the decision making process of the customers. Users were placed into a group at onboarding in the experiment, and informed they would receive messages over the next several days encouraging them to use a new savings account they had registered for. Consumers are motivated by a sense of "relative-rank" among their peers, even when the identity is relatively loose. 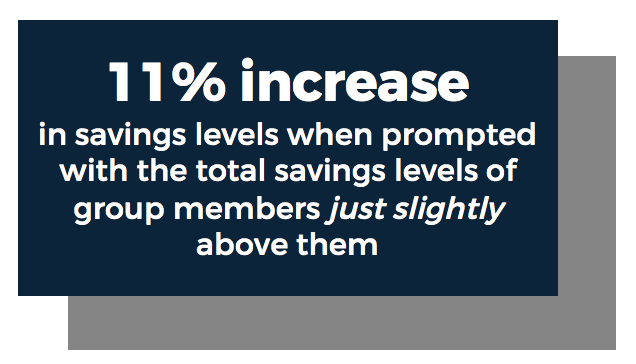 Participants responded positively to the consistently higher, yet attainable savings prompts of their peers, increasing their savings rates by 11% over the course of the trial period as compared to the control. This implies that even with weak social identities (onboarded at the same time, from the same neighborhood), can carry weight in an individual's perception of how they should act and motivate a behavior. The more features participants had to compare, the more likely they made an active choice between product options. However, they were also more likely to make a sub-optimal choice. We found that although having more choices at their fingertips engaged the participants, it often resulted in cognitive overload and suboptimal product choices. The frame of the message matters -- positive framing may negatively influence mobile saving in resource-scarce environments. Aspirational and agency-framed messaging ended up performing significantly worse than the generic savings message. This reinforces the importance of testing and evaluation before rolling any ideas out at scale.